The First Cataract cuts through Aswan (24°04′41″N 32°52′41″E﻿ / ﻿24.078°N 32.878°E﻿ / 24.078; 32.878﻿ (First Cataract)). Its former location was selected for the construction of Aswan Low Dam, the first dam built across the Nile. The word cataract is a Greek word καταρρέω ("to flow down") although the original Greek term was Κατάδουποι(, οἱ - only masculine plural - there is no singular). However, none of the Nile's six primary cataracts could be accurately described as waterfalls, and given a broader definition, this is the same with many of the minor cataracts. Geologists indicate that the region of the northern Sudan is tectonically active and this activity has caused the river to take on "youthful" characteristics. 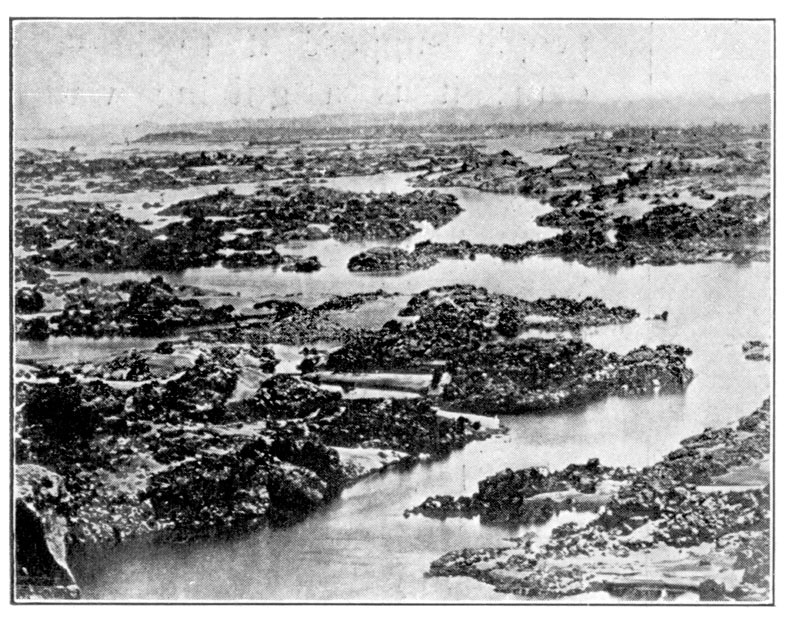 The Nubian Swell has diverted the river's course to the west, while keeping its depth shallow and causing the formation of the cataracts. Even as the river bed is worn down by erosion, the land mass is lifted, keeping parts of the river bed exposed. 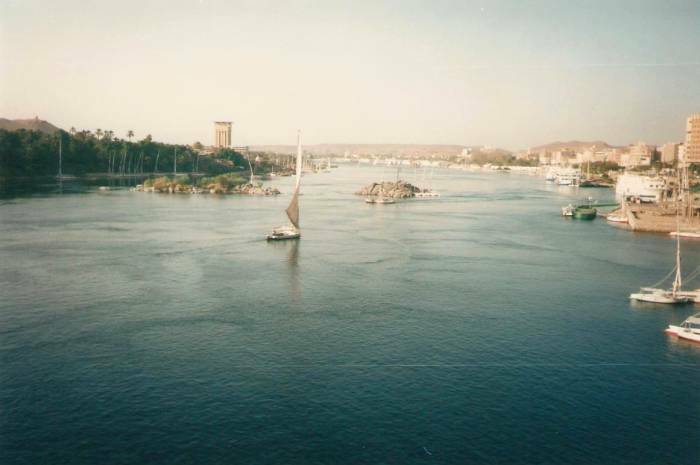 These distinctive features of the river between Aswan and Khartoum have led to the stretch being often referred to as the Cataract Nile, while the downstream portion is occasionally referred to as the "Egyptian" Nile. The geological distinction between these two portions of the river is considerable. North of Aswan, the river bed is not rocky, but is instead composed of sediment, and far from being a shallow river, it is believed that the bedrock was previously eroded to be several thousand feet deep. This created a vast canyon that is now filled by the sediment, some of which originated from the Mediterranean. For more information, see the Eonile as well as the Messinian salinity crisis. Despite these characteristics, some of the cataracts which are normally impassable by boat because of the shallow water have become navigable during the flood season. In ancient times, Upper Egypt extended from south of the Nile Delta to the first cataract, while further upstream, the land was controlled by the ancient Kingdom of Kush that would later take over Egypt from 760 to 656 BC. Eratosthenes gave a precise description of the Cataract-Nile: “It has a similar shape to a backwards letter N. It flows northward from Meroë about 2700 stadia, then turns back to the south and the winter sunset for about 3700 stadia, and it almost reaches the same parallel as the Meroë region and makes its way far into Libya. Then it makes another turn, and flows northward 5300 stadia to the great cataract, curving slightly to the east; then 1200 stadia to the smaller cataract at Syene (i.e. Aswan), and then 5300 more to the sea.”. The six cataracts of the Nile are depicted extensively by European visitors, notably by Winston Churchill in The River War (1899), where he recounts the exploits of the British trying to return to the Sudan between 1896 and 1898, after they were forced to leave in 1885. ^ Thurmond, Allison K.; Stern, Robert J.; Abdelsalam, Mohamed G.; Nielsen, Kent C.; Abdeen, Mamdouh M.; Hinz, Emily (2004). "The Nubian Swell" (PDF). Journal of African Earth Sciences. 39 (3–5): 401–407. doi:10.1016/j.jafrearsci.2004.07.027. ISSN 1464-343X. ^ Warren, John (2006). Evaporites:Sediments, Resources and Hydrocarbons. Berlin: Springer. p. 352. ISBN 3-540-26011-0. ^ "Cataracts of the Nile". Archived from the original on 17 February 2010. Retrieved 17 February 2014. ^ Strabo (1932). The Geography. Vol VIII. Translated by Jones, H. L. Harvard University Press – via Bill Thayer. Wikimedia Commons has media related to Cataracts of geoscience/remsens/Nile/cataracts.html The Cataract Nile and the Great Bend. This page was last edited on 14 January 2019, at 23:38 (UTC).